My husband is not very keen on vegetarian meals so when I said I was making this to use up some courgettes my friend Erica had given me his face looked like he had sucked a lemon. In spite of this he tucked in with relish, cleared his plate completely and grudgingly declared ‘it wasn’t bad’. I thought it was absolutely lovely. It was light and refreshing and the pine nuts gave it a lovely nutty flavour and added crunch. I will definitely be making this again no matter how much he protests and begs for meat! Pine nuts are very good for you. Here are a few nutritional facts. They are rich in mono-unsaturated fatty acids like oleic acid (18:1 undifferentiated fat) that helps to lower LDL or “bad cholesterol” and increases HDL or “good-cholesterol” in the blood. Research studies suggest that Mediterranean diet, which contain good amounts of monounsaturated fatty acids, vitamins and antioxidants, helps to prevent coronary artery disease and strokes by favoring healthy blood lipid profile. Pine or cedar nuts contain essential fatty acid (ω-6 fat), pinolenic acid. Recent research has shown its potential use in weight loss by curbing the appetite. They are an excellent source of vitamin E; contain about 9.33 mg per 100 g (about 62% of RDA). Vitamin E is a powerful lipid soluble antioxidant, required for maintaining the integrity of cell membrane of mucus membranes and skin by protecting it from harmful oxygen-free radicals. Furthermore, pines are one of gluten-free tree nuts, and therefore, are a popular ingredient in the preparation of gluten-free food formulas. Such formula preparations can be a healthy alternative in people with wheat food allergy, and celiac disease. They are an excellent source of B-complex group of vitamins. Finally, pine nuts contain healthy amounts of essential minerals like manganese, potassium, calcium, iron, magnesium, zinc and selenium. Consumption of pines helps the body develop resistance against infectious agents and scavenge harmful oxygen-free radicals. I couldn’t find this recipe on the Woman and Home website so I have written it out below. Zest both the lemons and juice just one of them. Drain the pasta when cooked and return to the pan. 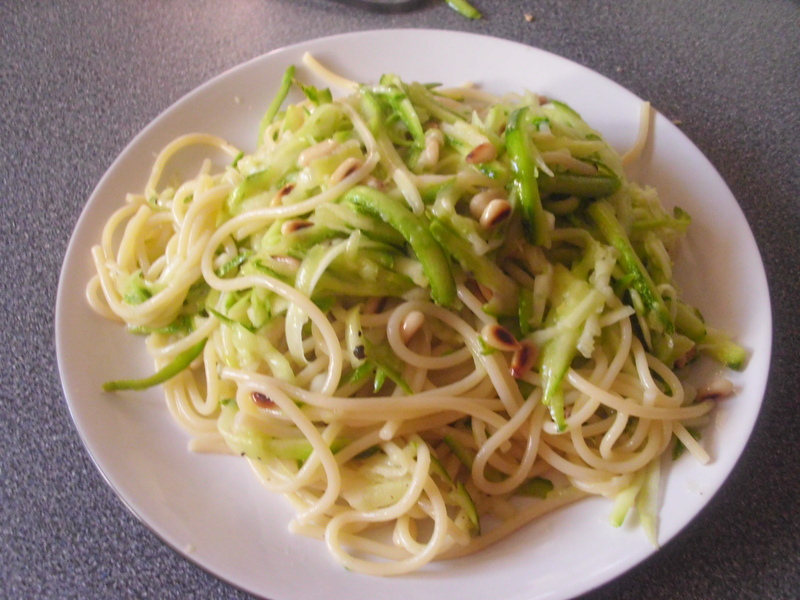 Add the olive oil, lemon juice and zest, courgettes and pine nuts.